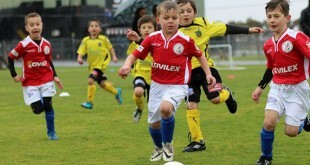 NORTHCOTE City suffered its first loss of the season at the hands of Melbourne Knights at Knights Stadium on Sunday afternoon. 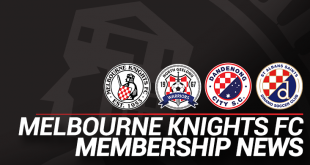 In his second game after returning to the club, Andrew Barisic’s header at the 75th minute mark was enough for the Knights to take the three points from the contest, all but cementing their spot in the 2013 Victorian Premier League finals series. 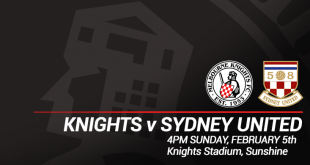 With heavy conditions underfoot, Northcote placed pressure on the Knights very early, but the Knights had arguably the better of the chances in the first half and were unlucky not to see themselves ahead at the break. Marijan Cvitkovic attempted to continue on his goalscoring form inside 10 minutes after a perfect ball in by James McGarry found the midfielder, but his diving header caused no trouble for Frazer Siddall. Rashid Mahazi was close to being left red-faced after nearly slotting the ball into his own net, his flick rolling just wide of a diving goalkeeper. Mid-season signings McGarry and William McLachlan continued on their seamless transition into the squad, combining for a great chance at the 22nd minute mark, but McGarry’s shot rolled just wide across the goal face. The Knights had the last attempt of the half when McGarry’s free kick floated above all players waiting in the box, ensuring both sides would be deadlocked at the break. Northcote’s first real chance came right after the resumption of the game when Evan Kounavelis used his pace to latch onto the ball, his shot from outside the box sailing just wide of the upright. Kristian Konstantinidis stood solid in defence for Northcote, making many goal-saving clearances on the last line of defence throughout the contest before being substituted off the ground with 10 minutes remaining following a heavy collision. It was halftime substitute Barisic, however, who would be the hero for the Knights after an inch-perfect cross from Milan Batur found the striker who coolly headed into the back of the net. 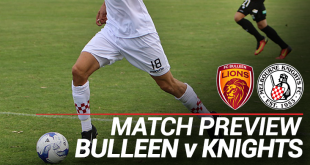 There would be a few nervy final moments for Knights players and fans as the league leaders pushed to find an equaliser, but their defence stood solid to ensure the hosts would remain in the top four. Northcote remains at top of the table, though its lead has been reduced to six points. It hosts Richmond next week, while the Knights travel to S.S Anderson Reverse to take on final contender Port Melbourne on Friday night. Under 21s: Postponed after 45 minutes with score at 0-0.